Tagged import files differ from standard files in that multiple rows contain data for a single bill and/or multiple services are contained within the file. In a tagged import, a file containing 16 rows may be for just one bill. Click on Billing Data in the menu on the left hand side of the page to expand the selection. Click on + Add Import Def. at the top of the menu on the left hand side of the page. Definition Name and Definition Description are required fields. These should clearly indicate what is being imported for easy reference later on. Set the File Type, Delimiter Character, and String Delimiter according to your vendor or utility format. The default settings should match the majority of files, however, it's possible that your vendor uses other options (for example, a tilde (~) rather than a comma). Setting Header Rows tells the system how many rows to ignore at the top of the file. This should be set based on your vendor file. The number of Header Rows can fluctuate from 0 - 23. *Note: The Header Rows may not only be column headings. If there is any additional information at the top of the file, such as the vendor address or contact information, that would need to be accounted for as well. Check the box next to Tagged line items. Click on View/edit tag list to enter the name of the tag from the import file and the corresponding line item. *Note: Tag Names are flexible and can be changed in the import file as long as the proper line item is applied. Make sure to select the proper Meter Unit as the default may not always match your import file. Click OK to return to the General screen once you have added all of your tags. Date Format is a required field. Select the appropriate format from the drop down menu. *Note: The file may require alteration prior to import to ensure that all dates are in the selected format. Select the appropriate Utility Vendor from the drop down menu. Check the box to Ignore Zeros if you would like line items with both zero use and zero cost to be ignored. After you click Save, you will be able to click on the Columns section. Click + Add Column to begin populating information. Add all columns that are present in the import file. The system will return an error if the import file has more fields than are listed under the Columns section. *Note: This may include blank fields above, below, or in between populated fields. Header spaces are required to be included in the import setup. Be certain to identify the column containing tags by selecting IMPORT TAG in the appropriate column. Once you have entered all of the necessary information, click on the General tab. Click the Update/Validate File button to import your data. In the Update/Validate File window that appears, complete the requested information. Click Browse to locate the necessary file on your computer. *Note: The file must be in a CSV, Excel, or any delimited flat file format to be imported into Energy Manager. File Name is a required field. This will fill in with the name of the file you have selected. File Size will fill in with the size of the file you have selected. Check the box next to Overwrite data if you would like existing bills with the same Account Number and Bill Date to be replaced. *Note: This cannot be undone. The box next to Replace blanks will be checked by default. Leaving this checked will allow the system to replace all blank numeric values with zeros. Check the box next to Create meters if you would like the system to add missing meters for existing accounts. Clicking the Upload button will not automatically import the file. 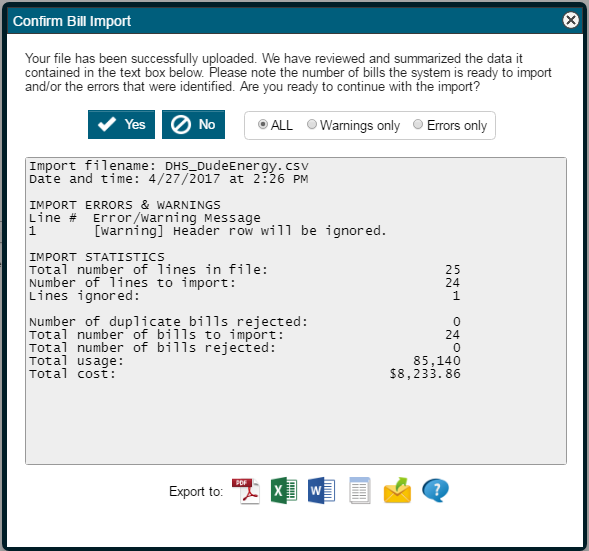 Energy Manager will run a validation check that allows you to review line counts, bill counts, and usage and cost totals prior to importing. It will also show discrepancies between the import definition and the file being imported. 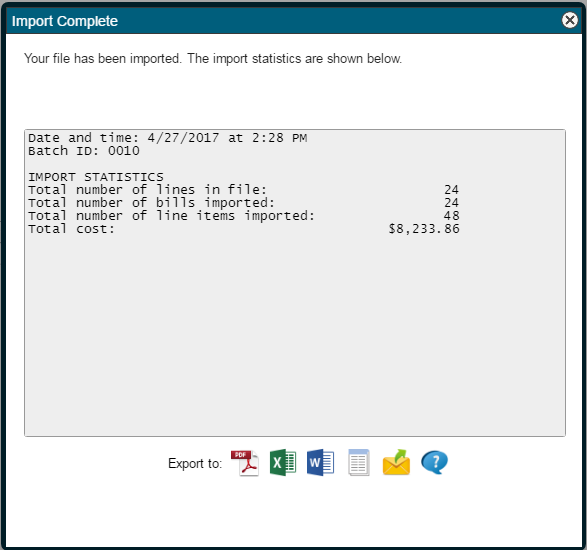 If there are errors, use the Line Number and error message description to locate the error in the import file and make changes to the file or import definition as needed. Click Yes to proceed with the import or No to cancel. A window will appear showing you the results of your import.